Not everyone needs a full size oven, and plenty of people simply can’t have one. With the CS858GRS6B compact steam oven you don’t have to choose between quality and size, as is always the case with Siemens appliances. First of all we should mention the Home Connect feature, which allows you to connect your StudioLine appliances and manage various options and settings. The possibilities are truly endless, making this a very popular feature which we are asked about all the time at our showroom in London. The large full colour TFT touchscreen allows quick easy control of all functions; no squinting at tiny LEDs with this one! Crisp and clear text from all angles and readable any time of the day in any lighting condition. 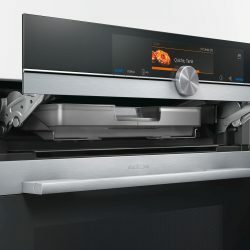 The CS858GRS6B’s most important feature for Shabbat observing users is of course the Sabbath mode, which is an option quite hard to find in nicely designed appliances. We get asked about this feature all the time, and can confirm that this and many of the other StudioLine appliances are very popular in the Jewish community. Why not come and see us in person for expert advice on Sabbath compliant kitchen hardware? With a one litre water tank capacity, you won’t have to refill too often, and with the ecoClean feature you won’t want to worry about that much either! Included are one wire shelf, a punched XL steam container, another in small size, and one unpunched in small. Lastly a full width enamelled pan and telescopic shelf to avoid being burned; never a bad feature to have.